Accueil Produits Bande originale La bande originale de “20 000 lieues sous les mers”. Sortie : 29 janvier 2008. 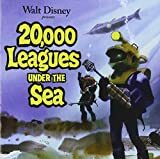 Film : 20 000 lieues sous les mers. 1. Main Title (Captain Nemo’s Theme) – 2:26. 3. Aboard the Abraham Lincoln / Hunting the Monster – 2:28. 4. A Whale of a Tale (par Kirk Douglas) – 2:09. 5. The Monster Attacks – 2:21. 6. Deserted Sub / Burial / Captured – 9:14. 7. Fifty Fathoms / The Island of Crespo – 8:45. 8. Storm at Sea / Nemo Plays – 2:25. 9. Strange Man of the Seas – 4:04. 10. Nemo’s Torment – 0:59. 11. Justified Hate – 1:29. 12. Searching Nemo’s Cabin – 4:02. 13. Ned’s Bottles – 0:43. 14. Ashore at New Guinea – 2:54. 15. Native Drums / Back to the Nautilus – 3:08. 17. The Giant Squid – 6:53. 18. Ambush at Vulcania – 4:47. 19. Nemo Wounded – 2:43. 20. Escape from Vulcania – 3:41. 21. Finale / Deep Is the Mighty Ocean – 0:56. 22. A Whale of a Tale (Single) (par Kirk Douglas) – 2:11. 23. And the Moon Grew Brighter and Brighter (Single B-Side) (par Kirk Douglas) – 2:35. 24. A Whale of a Tale (par Bill Kanady) – 2:24. 25. A Whale of a Tale (par The Wellingtons) – 2:07. 26. A Whale of a Tale (Reprise) (par Kirk Douglas) – 0:11.